They laughed When I Said I Could Generate Residual Income With Just One Little Review Site! But When The Affiliate Commission Started Coming In By The Thousands"
The profits were big, no doubt but it seemed like an endless treadmill running one product launch after another. So I had to find a way out a business model that is simple to set up, low on cost and most important of all No support issues! Dont take my word for it there are hundreds of underground niche marketers who have been quietly making a killing on the Internet that no one knows about. Its so easy to setup that people have been building these type of blogs by the HUNDREDS. 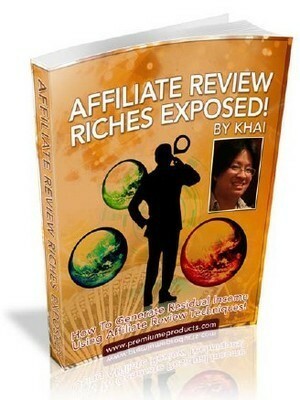 Its no wonder why no one wants to talk about affiliate review riches because they are so busy making money. The Concepts Behind Monetizing Affiliate Review Sites. In this book, you will learn how this concept works and how it is so simple that anyone can start doing it! How To Drive Traffic Easily To Your Website. These techniques utilize free traffic strategies no more paying huge sums for AdWords! How To Rake In Residual Income Month After Month! Learning these methods is very simple, even an Internet marketing newbie can pull it off.